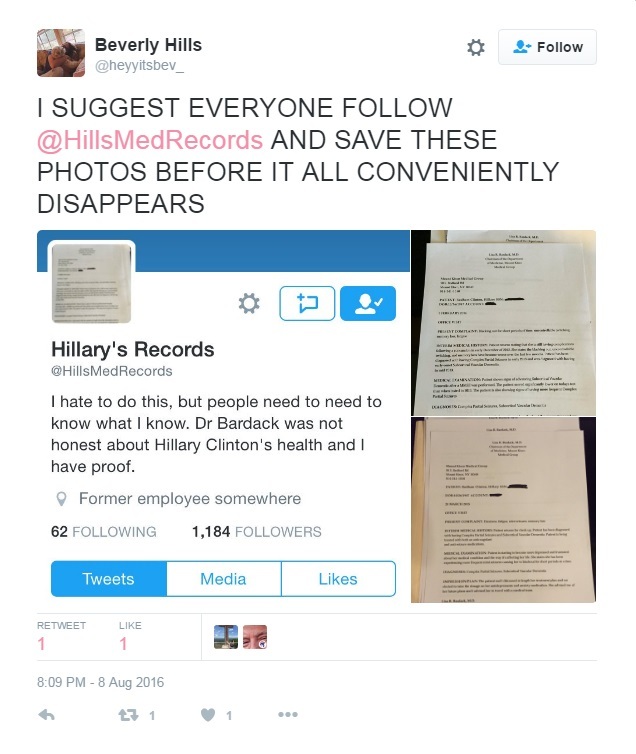 We have shown why we believe Hillary Clinton is unfit, physically and mentally, to become President of the United States, using video footage, testimonies and images through the years to show visual proof of our assertion, but last night and Twiiter account named @HillsMedlRecords claimed that documents they uploaded are of Hillary Clinton's medical records from 2014 and 2015. If these documents are real.... it is over for Hillary. The original Tweet has since been removed by Twitter as the @HillsMedRecords user page no longer exists, but screencaps show she/he listed a note in their profile that stated "I hate to do this, but people need to need to know. 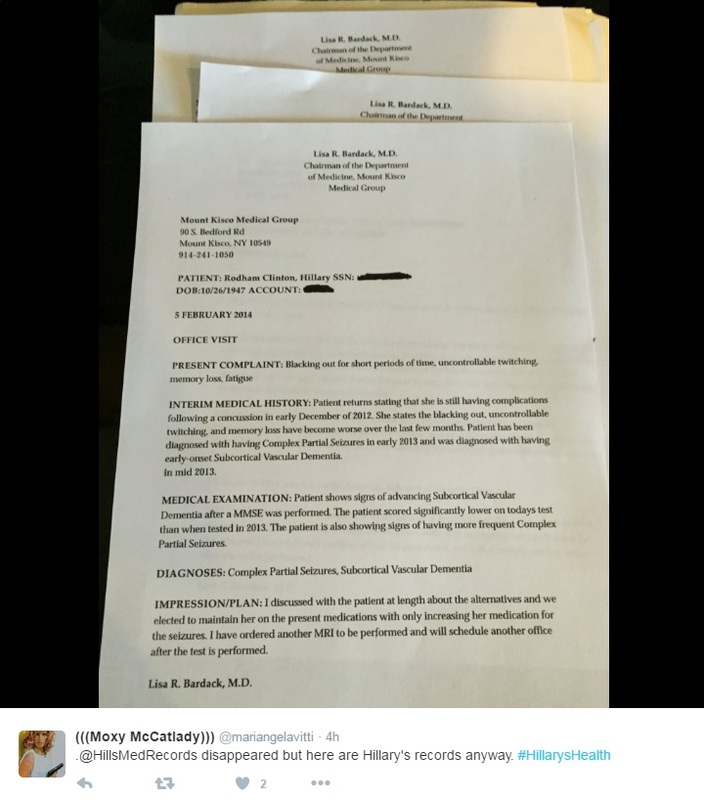 Dr. Bardack was not honest about Hillary Clinton's health and I have proof." 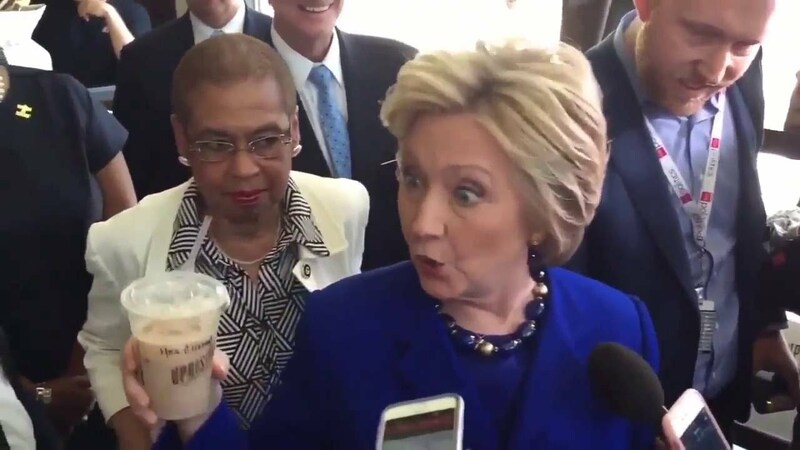 The reference is to Dr. Lisa Bardack, who is on record as Hillary Clinton's Physician, who in July 2015, issued a statement claiming "Mrs. Clinton is a healthy female with hypothyroidism and seasonal allergies, on long-term anticoagulation. She participates in a healthy lifestyle and has had a full medical evaluation, which reveals no evidence of additional medical issues or cardiovascular disease. Her cancer screening evaluations are all negative. She is in excellent physical condition and fit to serve as President of the United States." The whistleblower account now shows up as "Sorry, that page doesn't exist," but the documents he or she claimed were Hillary's medical records, live on as people downloaded and reuploaded them and are sharing them still. The first is purportedly from February 5, 2014, stating the "present complaint" is "Blacking out for short periods of time, uncontrollable twitching, memory loss, fatigue. 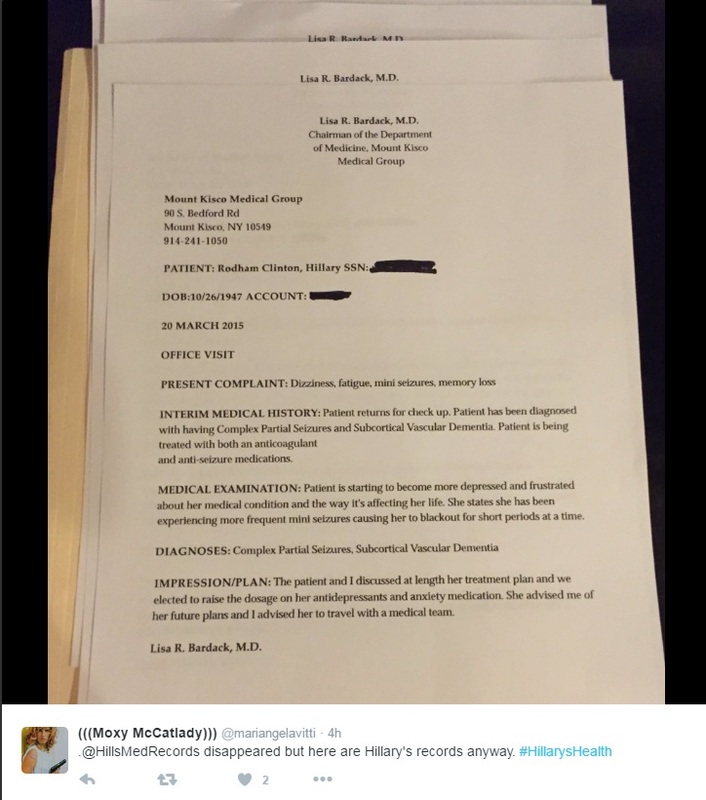 It lists a Interim Medical History, Medical Examination, then the Diagnosis of "Complex Partial Seizures, Subcortical Vascular Dementia"
The second document the user claimed was leaked Clinton medical records is dated March 20, 2015, listing "Dizziness, fatigue, mini-seizures, memory loss" as the "Present complaint" for that office visit. Diagnosis on that document also states "Complex Partial Seizures, Subcortical Vascular Dementia." Subcortical vascular dementia, also called Binswanger's disease, is caused by widespread, microscopic areas of damage to the brain resulting from the thickening and narrowing (atherosclerosis) of arteries that supply blood to the subcortical areas of the brain. Atherosclerosis (commonly known as "hardening of the arteries") is a systemic process that affects blood vessels throughout the body. It begins late in the fourth decade of life and increases in severity with age. As the arteries become more and more narrowed, the blood supplied by those arteries decreases and brain tissue dies. Brain imaging shows the brain lesions typical of the disease and is essential for an accurate diagnosis. The most characteristic feature of vascular dementia is psychomotor slowness - an increase in the length of time it takes, for example, for the fingers to turn the thought of a letter into the shape of a letter on a piece of paper. Other symptoms include forgetfulness (but not as severe as the forgetfulness of Alzheimer's disease), changes in speech, unsteady gait, clumsiness or frequent falls, changes in personality or mood or urinary symptoms. EMEDICINE highlights a couple points under their "Impaired consciousness," category that explains how Clinton can function publicly, even after a mini-seizure, and why some are claiming that one of her protective detail members is truly a "handler." If these documents are real and that is a big IF, then they would explain Hillary Clinton's apparent "seizures" caught on video, her weird behavior, her frequent documented falls, her inability to even climb stairs on her own... and so much more. There is no doubt that whoever the supposed "whistleblower" is that they are familiar with medical sysmptoms, because they understood the relevance of those particular diagnoses in conjunction with the very public sysmptoms shown by Hillary Clinton indicating some serious medical health issues.